Three years ago our neighbours introduced us to the Colavecchia Primitivo - excellent everyday drinking wine at a ludicrously cheap €1.10 per litre. We bottled that first batch using old bottles and recycled corks pushed in by hand. I decided that we should bottle using fresh corks and a bottling widget but it has taken a couple of years to get round to doing that. 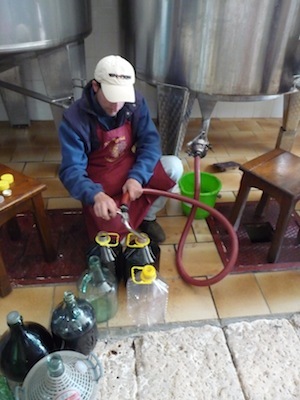 While we were out in Puglia this Easter we took our friends Tim and Sarah and Elizabeth over to the cantina armed with two 5 litre plastic demijohns and bought their *cough* top-of-the-range primitivo. Back at Trullo Azzurro I co-opted Tim to assist in the bottling process. Mind you I'm not sure we needed to bottle all 10 litres because we had drunk half of it by the time we went home. The rest will be awaiting us on our next visit.